Curtis Le Roy Blefary was born July 5, 1943 in Brooklyn and grew up in Mahwah. He was named after Curt Davis, one of the Brooklyn Dodgers’ top pitchers when he was born. Curt was a star football and baseball player for Mahwah High School. He was an All-State fullback and a switch-hitting third baseman and catcher; as a pro he hit exclusively left-handed. He possessed explosive athletic talent but also an explosive temperament. Curt attended Wagner College in Staten Island and played for the football team in the fall of 1961. The Yankees signed him in 1962 and converted him to an outfielder in the minors. He had turned down bigger bonuses from other teams to play for his favorite team, and was crushed when New York dealt him to the Orioles during the 1963. Curt was promoted to the big leagues in 1965 and led the club with 22 homers and 88 walks. At season’s end he was named AL Rookie of the Year. 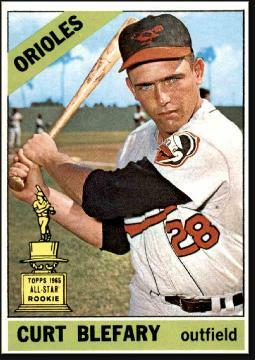 Curt had another solid season in 1966 and helped the Orioles win the pennant. He managed just one hit in the World Series, but Baltimore pulled off an amazing sweep of the Dodgers. In 1967, Curt was among the league leaders in homers and RBIs. In 1968, he demonstrated his versatility by catching 40 games for the O’s—including a no-hitter by Tom Phoebus. Unfortunately, his averaged declined to .200, which made him expendable. The following spring, he was traded to the Astros in a deal that brought Mike Cuellar to Baltimore. Cuellar tied for the Cy Young Award in 1969. Curt played every day for Houston in 1969 and hit better against lefties than he had with the Orioles. The Astrodome ate into his home run total, but he reached career-highs in doubles and triples, batting .253 overall with 16 homers and 67 RBIs. As always, he was selective at the plate, drawing 77 walks. Curt roomed with Don Wilson, Houston’s star African-American pitcher, on the road—a fact that is often overlooked in baseball’s story of integration. In 1970, Curt realized his dream, when he suited up for the Yankees following a one-for-one swap for Joe Pepitone. The Yankees were glad to have him—he had killed their pitchers during his AL days. Alas, Curt was seduced by Yankee Stadium’s short porch, and abandoned his line-drive swing for an aggressive uppercut. The pitchers caught on and gave him nothing; he didn’t reach the seats until June and finished the year with just 9 home runs. The Yankees traded him to Oakland early in the 1971 season. 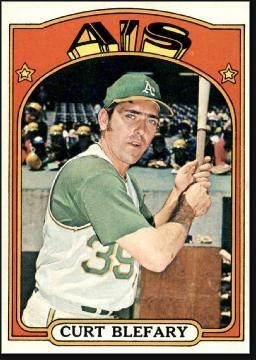 The A’s traded him to the Padres in 1972. At 28, Curt should have been in the prime of his career. Instead, he was drinking too much, playing too little and wearing out his welcome with his play-me-or-trade-me complaints. San Diego released him after the season, the Braves invited him to Spring Training in 1973 but he failed to make the club. At 29, he was out of baseball. He retired with 112 lifetime home runs—most hit during the “era of the pitcher”—and an on-base percentage of .342, which was more than 100 points higher than his batting average. Curt worked various jobs over the next decade and was a regular at memorabilia and autograph shows in the 1980s and 1990s. He loved chatting with fans and former players. He hoped to coach at some level but that did not work out. In the latter part of the 1990s Curt suffered from severe pancreatitis, which may have been a result of his long history of heavy drinking. He passed away at his home in Florida early in 2001. He was just 57. At his request, he had his ashes scattered in abandoned Memorial Stadium in Baltimore.